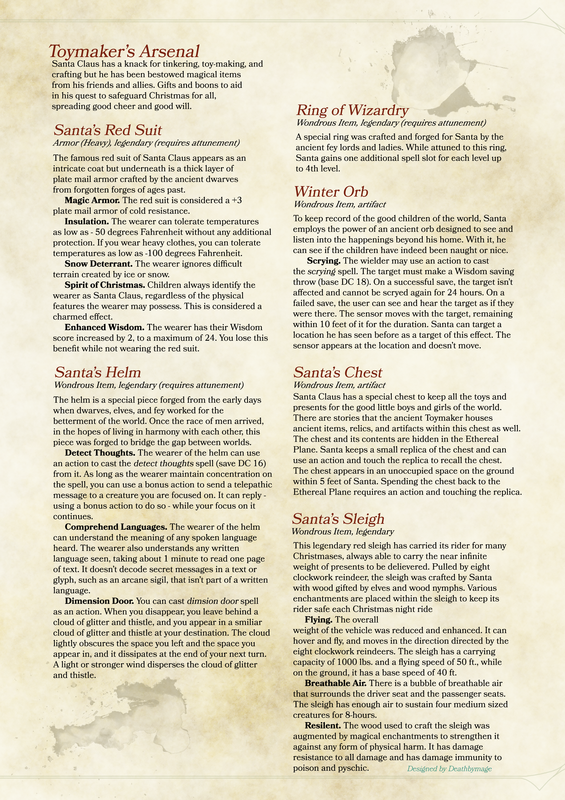 Last year, I had a fun idea to put Santa Claus into a D&D 5th Edition stat block. I polled the community for what sort of class would best fit him, which ended up being a bard. It was a lot of fun writing the stat block and spending some time making fun content for the community. If you want to see last year’s Santa Claus post, click here. Update (2017): We also added two versions of a Warlock Santa Claus (click here). Once again I polled the community, this year the Wizard archetype won by a huge margin. I had to think more about what I wanted to do with a Wizard stylized Santa. Unfortunately, the Artificer archetype from the Unearthed Arcana was rather lacking and just didn’t fit the motif of a tinker-toymaker. BUT we just recently got gifted the Forge domain for the Cleric which heavily revolved around crafting and forging as a the major themes. 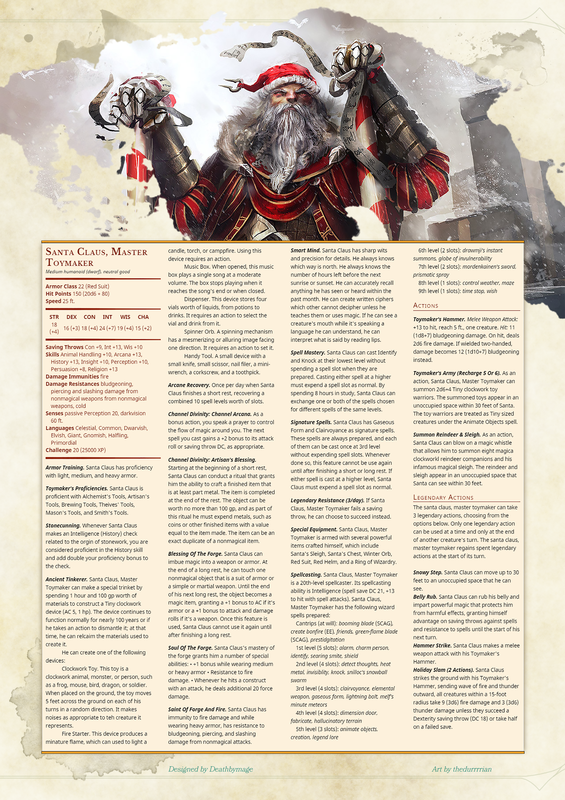 Several months ago we were also given a Theurgy Wizard tradition, which allowed the Wizard to gain the benefits of a Cleric’s domain features and even access some of the domain specific spells. So do I feel that I might’ve cheated ourselves out of a wizard version of Santa Claus? Well yes and no. He’s still a wizard, that’s for sure, but a different sort of wizard who meshes the divine inspiration of crafting and creation. Trust me when I say that if I were to do Santa as a cleric, it wouldn’t be the Forge domain. My vision was always a wizard tinkerer version of Santa. If you want to check out the Unearthed Arcanas for the Forge domain click here, and if you want to see the Theurgy Wizard Tradition click here. My idea and inspiration for a tinkerer Santa was stemmed from the idea of Santa building toys like a dwarven artisan or even a gnome tinkerer. I didn’t want a gnome, but a dwarf fits the bill for a bearded character that was sturdy and could drink tons of eggnog. Plus the idea of a dwarf wizard in heavy armor was a pleasant sounding idea that I just couldn’t resist. This one was a little more intricate, we have a Santa that can summon a small toy army when outnumbered and lay waste with arcane spells. Did I mention there is a flaming hammer? Yea, there’s one of those too. I hope you enjoy this little rendition of Santa and look forward to next year’s iteration. And something extra, a statblock for the Toy Soldiers! 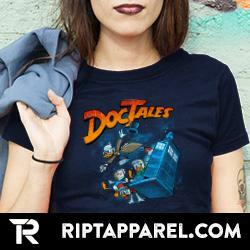 And finally some new items! Alright guys, have fun with these and Happy Holidays! Previous Previous post: [Death By Review] Arcane Archers, Knights, and more! Oh my fighter! I so love this! 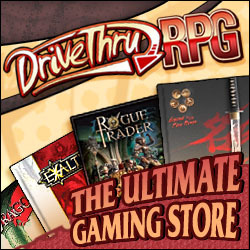 I found your previous edition and planned to use it in a campaign I’m creating/running. However, I’m thinking this edition would better fit the bill. Would you happen to have a PDF version I can download? Sure no problem, shoot me an email at archmage@deathbymage.com and let me know you want the PDF and I’ll gladly email it to you. Thank you! Maybe I’m blind, but I can’t find a way to download these that doesn’t involve just saving the images (which are much too low resolution to be useful/legible). Any help? On desktop, you click on the image and it should lead to a popup of the images. Mobile is similar and should lead to a new tab in most instances. No such luck – maybe a problem w/ Chrome? I’m using chrome and have no issue clicking on the images while viewing it as a normal visitor. Might need to restart the cache on your browser? This is the weirdest, but still no luck even after doing that. I’ll try a diff browser, just for s&gs. No luck in Firefox either… doesn’t make sense. If I r-click and Open image in new tab… they’re not any larger. And clicking on the images didn’t produce the larger versions? That is correct; they’re not clickable and the only alternative I can think is to do as I mentioned above… hum. Alright I went back and adjust a few settings, let me know if it works now. Hey, DBM! Whatever you did, it worked! Glad it worked for you! 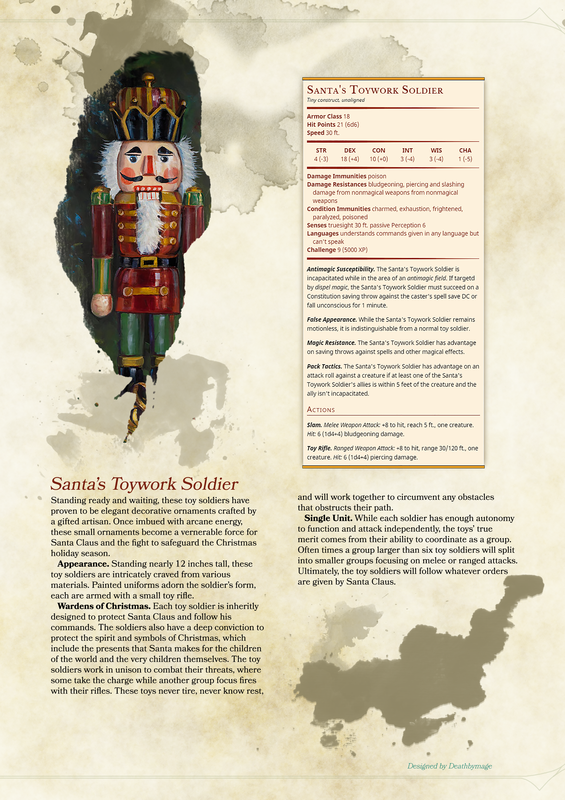 The Toymaker Santa is available as a PDF on my Patreon btw if you feel interested. Woops, fixed that one too. They should all be good to go now.